Not for the first time in their short F1 history, Red Bull have caused controversy regarding flexible bodywork around the front wing area. 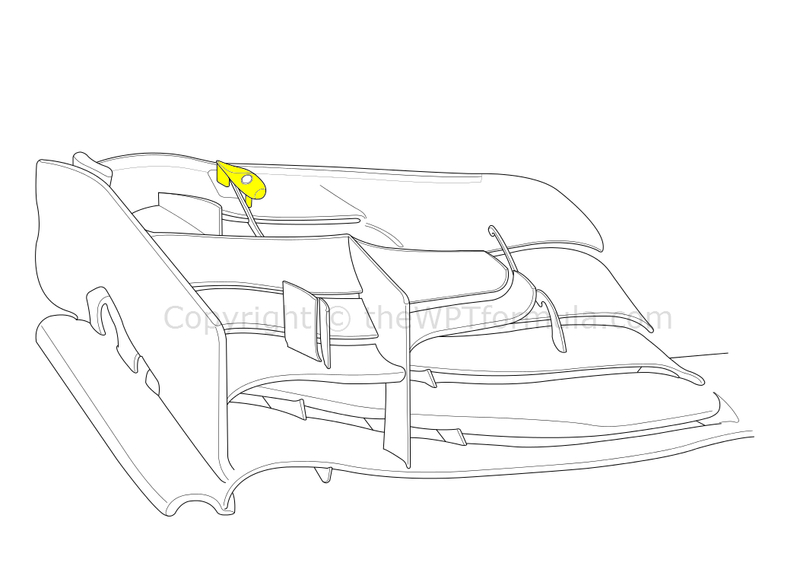 In Abu Dhabi both RB10s were excluded from qualifying after the FIA discovered that the upper flap on the front wing was flexing far too much, induced by an illegal device that is believed to be in the form of a leaf spring. Just to clarify, here is a section from the technical regulations which explains what bodywork design has to comply to. a)Must comply with the rules relating to bodywork. b)Must be rigidly secured to the entirely sprung part of the car (rigidly secured means not having any degree of freedom). c)Must remain immobile in relation to the sprung part of the car. Of course, everything eventually flexes and you can see bodywork moving all the time – this is designed into the components to increase aerodynamic performance. However the rules basically state that the bodywork is not allowed to be moved deliberately in order to gain an advantage except for DRS. You could say that bodywork must only move unaided and that no other component can exaggerate this movement. 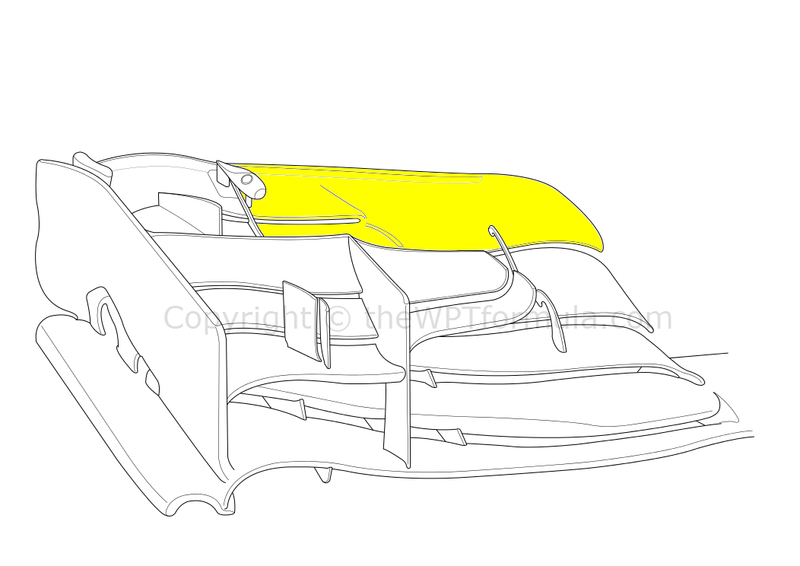 Above is an illustration of the controversial wing, which has a couple of minor changes to the wing seen in the last round in Brazil. The endplate’s lipped trailing edge has been stumped a little and the front wing adjuster bulb attaches to a small metal plate, whereas before this attached straight to the wing to the left of the guide fence. It is this bulb that we are concentrating on when it comes to the “flex-gate” scenario. It is believed to be made out of rubber and can therefore contract when under load, before returning to its equilibrium position once this load has been removed. Before I go any further, this is not an official verdict of what is actually going on, this is my interpretation from the evidence given by the FIA and what I have seen floating around the internet. Highlighted above is the bulb complete with its mounting block, which is attached to the thin metal plate as mentioned above. The bulb is believed to be made of rubber, whilst the block is either metal or carbon fibre. The hole in the bulb allows a mechanic to adjust the upper flap’s Angle of Attack (AoA) via a hex bolt. This bolt passes from the bulb down to a thread on the upper flap. Turning the bolt clockwise or anticlockwise winds the flap up or down the thread. The AoA increases/decreases as the flap is fixed to the lower elements via arched metal retainers – these are used to prevent the slot gaps closing, which also comes under Article 3.15. This illustration shows which portion of the wing the adjuster is moving. 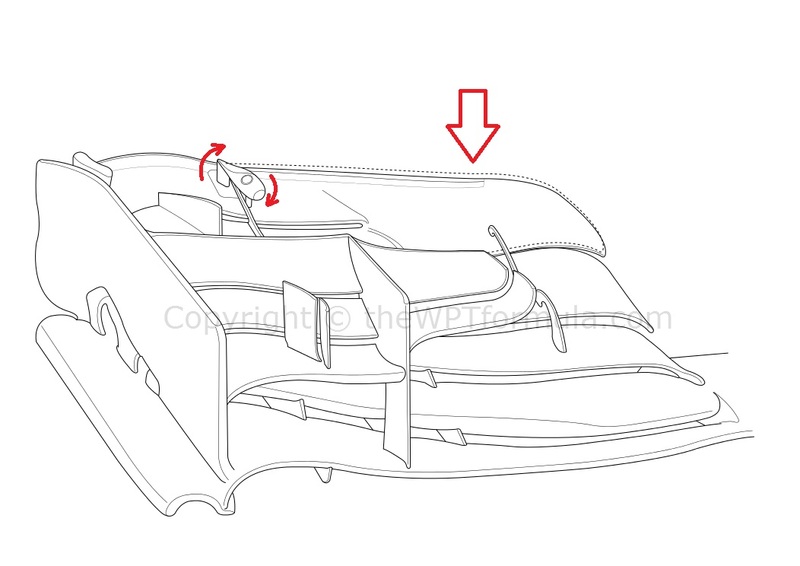 The outboard region of the upper flap is fixed – this is a common theme up and down the grid as the outboard section is crucial to passing airflow efficiently around the front tyre. Disturbing this region would have a negative impact on overall downforce production, rather than the small tweak that an adjustment to the inboard flap section provides. In normal circumstances the upper flap flexes quite a lot under load anyway because of the way the carbon fibre is layed up. It is designed to flex in a certain way across a specific speed threshold to manipulate airflow to a desired location. This increases general downforce production but it is primarily engineered in for car balance. At low speed you want a higher AoA on the front wing as the car is producing little front downforce. This makes the car more pointy and it also looks after the front tyres. As speed increases, a higher front wing AoA is still OK but this can damage the rear tyres as the car tends to oversteer – it is imbalanced front to rear. That is why the engineers tend to head towards a setup that induces a little understeer to look after the rear tyres in race conditions. This involves taking out some front wing angle although there are a number of mechanical changes that contribute to this. Because the bulb is made of rubber and the hex bolt attaches from the bulb directly into the flap, as soon as load is applied to the flap the whole adjuster assembly is allowed to move more freely – the leading edge of the bulb bends downwards and it begins to rotate around the attaching block/metal plate. Equally, the metal plate is allowed to extend upwards slightly (this is where the alleged leaf spring system comes into play), further lowering the flap’s AoA. You can see that not only is the AoA significantly reduced, but there is also some partial closing up of the slot gap between the upper and lower flap. This will partially stall the wing, especially at high speed when the aerodynamic load is at its greatest, and thus reduce drag. However its primary function is to reduce AoA at high speed to induce a little understeer to protect the rear tyres, whilst still maintaining a high AoA at low speed for maximum downforce in the slower corners. It is 100% illegal and that is why they were kicked out of qualifying. Red Bull have come out and suggested that others are doing something similar, but as far as we are aware no other team has a rubber bulb and leaf spring system as their front wing flap adjuster! Some have said that this has been on the car as far back as China, when it was noted that the bulb’s colour had changed from purple (to match the front wing’s colour) to black, which is what it is now. 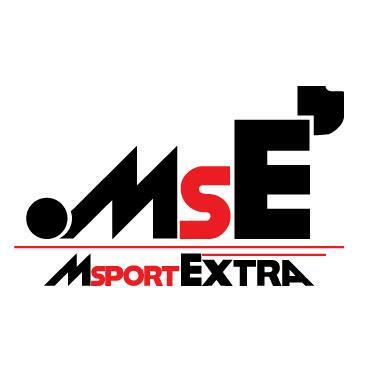 This entry was posted in Analysis, General and tagged 2014, abu, bull, dhabi, f1, flap, flexing, front, gp, illegal, rb10, red, upper, wing on November 26, 2014 by thewptformula.